So far this week there's been a top 10 under £10, a Monday Mani featuring some amazing autumn appropriate nail polishes and an instalment of The Makeup Bag, Autumn Edition. So today's, it's over to the handbag essentials. We all have certain products we like to take with us, whether it's just a lip balm, or hand cream, it's still an essential. With the colder months that are fast approaching, there's certain concerns that need to be looked after, like dry skin, rough hands, etc. y'know what I'm sayin'? 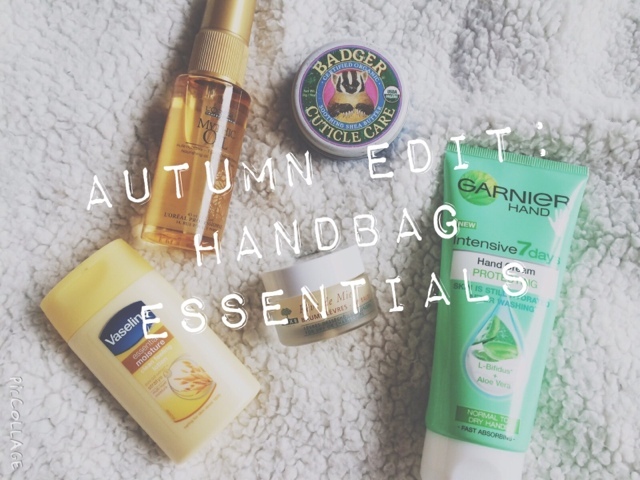 So here's some of my handbag beauty essentials. Starting off with the lips. There's normally a handful of lip balms floating around at the bottom of my bag, but the one that has to come absolutely everywhere with me is the Nuxe Rev de Miel Lip Balm. This stuff makes your lips so friggin' soft and smooth and banishes chapped, dry lips forever. I have numerous tubs of these scattered around in my bags, on my bedside table and dressing table. It's expensive for a lip balm but for one that actually does something, it's totally worth it. Next is nails, and in the colder months, cuticles and hands get very dry and even cracked, so the Badger Cuticle Care is my favourite cuticle nourishing product available. I've tried oils, creams, serums, gels, all sorts, but this one is by far my favourite. It has beeswax and Shea butter and loads of other essential oils which just help to soften and hydrate dry cuticles, even brittle nails benefit from this stuff. Plus, it's smells divine. For those dry hands that pretty much everyone gets when they've been out in the cold or had gloves on, the Garnier Aloe Vera Hand Cream is my favourite remedy. If you haven't tried the Garnier Intensive 7 Days Hand Creams then you should. Not only do they hydrate your hands and make them super soft, it sinks in really fast and doesn't leave any greasy feeling which is perfect for me as I sit at work or at home and type pretty much all day so this really helps to nourish the hands. It lasts ages too, even if you wash your hands. For those super dry skin days, this Vaseline Essential Moisture Lotion is a perfect handbag sized moisturiser that can be applied to dry elbows, knees, and feet during the day. Nobody likes to have dry skin whilst they're at work or wherever you may be. I just have to have this with me at all times. Finally is hair. With the colder months, comes central heating. I for one have to battle with frizzy, static hair during the autumn and winter, and one thing I have found to help with that (and it also keeps hair nourished too) is hair oil. I used to carry little testers around with me that I get from my subscription beauty boxes, but this L'Oreal Mythic Oil cute, mini travel size came in my last one so this will last me forever. I already love this oil anyway as I have a full size too. But I just find that this not only nourishes my hair and adds a beautiful shine but with all the fatty acids and vitamins that are packed into it, it generally just smooths my hair down, it's lightweight and it doesn't make my hair look greasy. I have similar products like this that I've had in my handbag all year, and I always need them. Do you have any handbag beauty essentials?